Despite support for Windows XP finally ending three months ago, the ancient OS has only now fallen below the 25 percent market share mark. To add to the bad news for Microsoft, after only nine full months of availability, its latest operating system version, Windows 8.1, has lost share for the first time. The latest market share data from Net Applications shows that Windows 8 and Windows 8.1 lost a combined 0.06 percentage points (from 12.54 percent to 12.48 percent) between June and July. More specifically, Windows 8 slipped 0.01 percentage points (from 5.93 percent to 5.92 percent), while Windows 8.1 dipped 0.05 percentage points (from 6.61 percent to 6.56 percent). There is no surprise that Windows 8, which saw its biggest gain in August at 2.01 percentage points and its biggest loss in November at 0.87 percentage points, continues to slip. 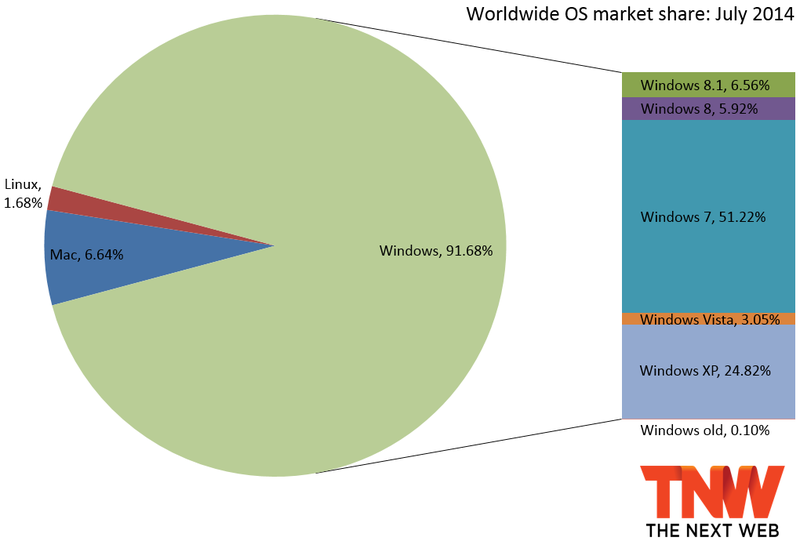 The fact that Windows 8.1 has managed to lose share, however, may raise eyebrows. While it’s possible the dip is just a blip, it doesn’t bode well for Microsoft, especially given that the upgrade path from Windows 8 to Windows 8.1 is merely a free download away. Meanwhile in July, Windows 7 managed to grab an additional 0.67 percentage points (from 50.55 percent to 51.22 percent). Windows 8 and Windows 8.1 usually do better combined than Windows 7 does, but some months the opposite happens, and the last three months haven’t been good ones for the new releases. Microsoft will likely one day struggle to woo users off Windows 7, just like it is currently trying to do with the headache that is Windows XP. Speaking of earlier versions, Windows Vista managed to gain 0.10 percentage points (from 2.95 percent to 3.05 percent). Windows XP dropped 0.49 percentage points (from 25.31 percent to 24.82 percent). While it’s great to finally see it fall under the 25 percent mark, the drop is nowhere near as large as it should be. In 2013, Windows lost share every month except for March, July, and November. So far in 2014, Windows has only slipped in January and April; it gained another 0.15 percentage points (from 91.53 percent to 91.68 percent) in July. OS X fell 0.09 percentage points (to 6.64 percent), while Linux slipped 0.06 percentage points (to 1.68 percent). Net Applications uses data captured from 160 million unique visitors each month by monitoring some 40,000 websites for its clients. StatCounter is another popular service for watching market share moves; the company looks at 15 billion page views. To us, it makes more sense to keep track of users than of page views, but if you prefer the latter, the corresponding data is available here (mobile and desktop operating systems are combined).